Sleep, oh blissful sleep. For many of us, sleep feels like a luxury that we fit between the hours of our work schedule, family needs, and the other obligations that most of us Americans try to squeeze into our ever busy schedules. Getting the sleep that we need during the few hours that we have to rest is crucial and so having a mattress that aids in that objective is paramount. But mattresses, like many things that we don’t replace but every-once-in-awhile, are easily forgotten and “just dealt with” until they become unbearable. Below are some of the tell-tale signs that your mattress needs to go. Often it’s easy to find lumps in mattresses that are cheap or those more expensive mattresses that need to be retired. If you see multiple lumps or one large lump, it’s probably time to get a new mattress. These lumps will not only be uncomfortable, but they may cause you not to receive the proper support that you need while you sleep and will create pressure points that could cause soreness or worse if you continue to sleep on a worn out mattress. Memory foam is wonderful, until it isn’t. Old memory foam that is in a cool room will often become hard overtime. However, if a mattress is kept in a warm room, it may become overly soft and unsupportive. The change in firmness can create discomfort, causing you to sleep poorly, as well as experience soreness and create other long term issues. 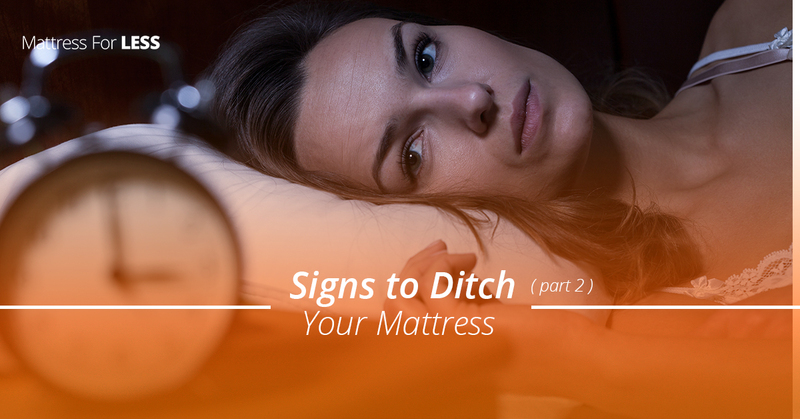 Stay tuned for more posts about signs your mattress needs to retire. If you’re ready for a new mattress, headboard, or pillow be sure to stop by Mattress for Less! We are having a Memorial Day Sale with mattress sales as much as 70 percent off! If you live in the Newington or surrounding area, don’t miss out on our mattress sales and other great deals!